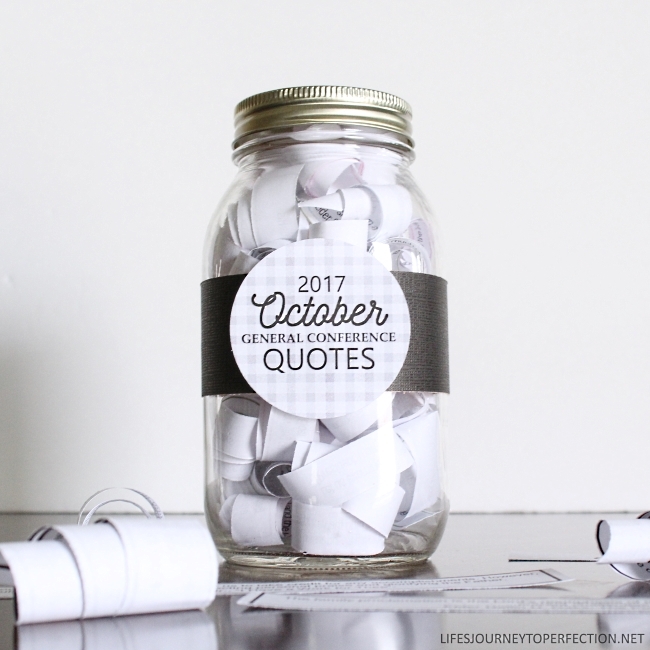 I love November and May because we get to focus on the messages from General Conference for our Visiting Teaching. 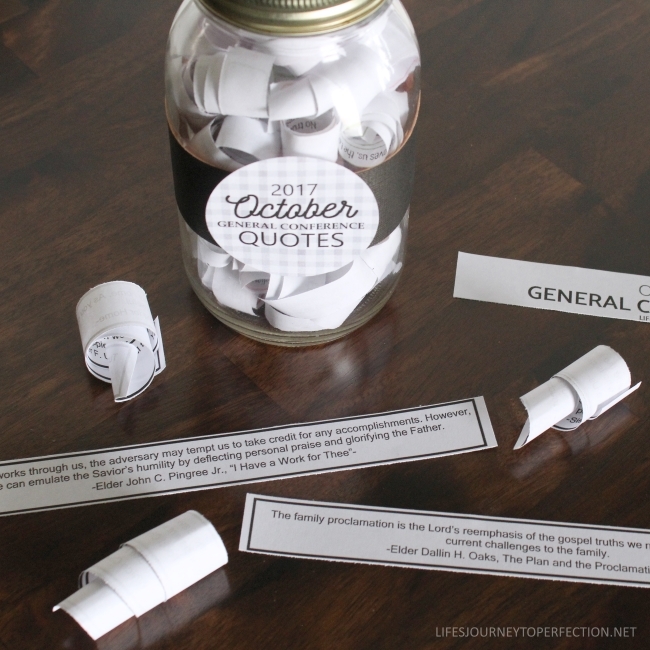 Last May, I had made a General Conference quote jar. I loved it so much, I thought I would do it again. It would also be a fun idea for the young women to make for a Personal Progress activity. Or even a girl could use it as one of her 10 hour projects. They are so easy to put together. You just need a canning jar, or some other container to put them in. Cut strips and then curl them onto a pencil or fold them up and place them in the jar. There is a lid cover also. Print cut out the lid cover and place it on the lid. 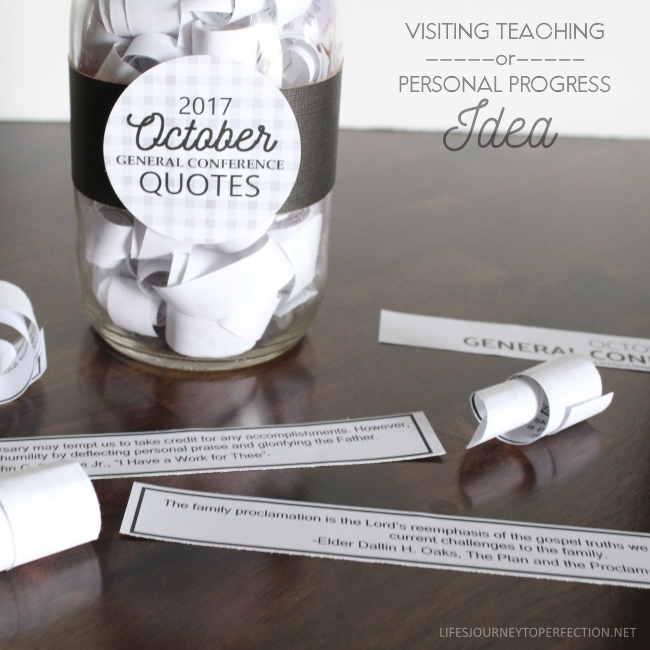 Cut a strip of black scrapbook paper and wrap around the jar and place the circle General Conference tag on the outside. It is encouraged that each day, you take a slip out of the jar. Read the quote and then ponder about it. How can you better apply that message into you life. If you would like to study it further, then find that talk and study it. Here is a link to October 2017 General Conference Messages. Thanks so much for stopping by!! Love you guys!!! Kim, This is sooooo cute! I love this and will be sending it to my college kiddos Thank you for taking the time to create inspiring messages and resources that lead us back to Him! Have a blessed day!!! Thank you so much!! Your comment meant so much for me to read today :) What a great idea to send them to college kiddos!! !